If You Can’t Look UP….Climb UP and Look Down! Yesterday I finished the blog post by observing that sometimes we need to stop and look up (the balloons caught in the tree)…you never know what you might see and looking up helps us climb over obstacles. Now I have decided to take my own advice but climb up instead of look up… In fact from up high I look down. It is amazing how it changes everything. 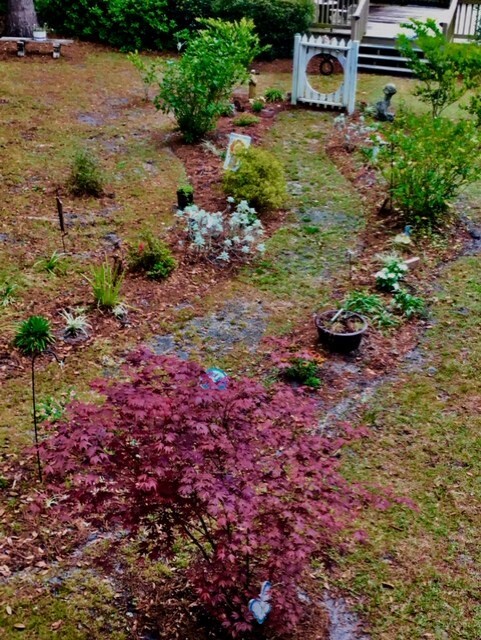 I climbed up the newly constructed (this past summer) stairs to the apartment over the potting shed and went out on the balcony to look down on the foggy early morning garden below me. What is it about adding height to a situation that gives us new “lenses” to look through? 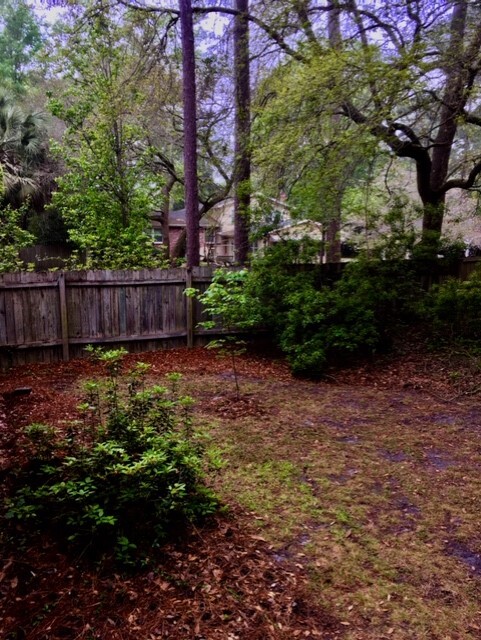 I was never able to “see” the outline of my garden until I first added the deck to the house…and with just two or three feet of additional height…suddenly my perception changed…visualization took root and with Anne’s suggestions…the garden path began that day. In the Bible Jesus seeks higher places to be alone or with a chosen few to gather his thoughts and then deliver them like the Sermon on the Mount. In scripture tiny Zacheaus climbed a sycamore tree to get a better glance of Jesus…looking down upon Him and nothing was ever the same again. “Little Zacheaus climbed up a sycamore tree because he could see Jesus from a new perspective, and that climb gave him a glimpse that changed his life forever. Seeing Jesus from a more lofty height is a life-changing perspective. “God is saying something to all His people by revealing so much of His will and truth from the mountain top. What He is saying is that our perspective determines our perception, or, in other words, our stand point determines what we see. 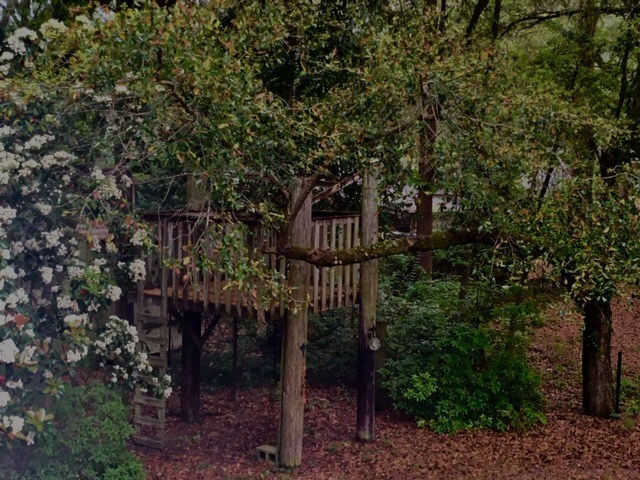 In the low country we have to try a little harder to get a height perspective but yesterday morning…in the foggy haze I was able to look down on the tree house, as well as, the garden and back yard. 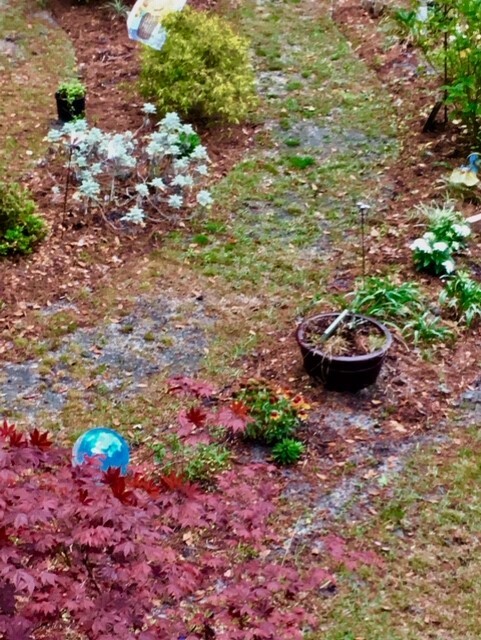 Everything looked orderly and well-thought-out…a different sense of sight than the level everyday analysis…where vision is limited by curves in the garden path. Luke helped me pull down dead limbs from the trees in the back yard late Sunday afternoon so yesterday (Monday morning) everything looked so more open and dead branches no longer blocked the tree house from sight. 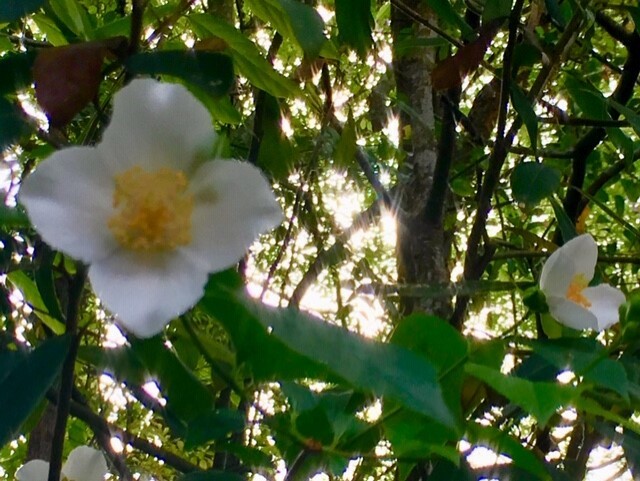 I could also see the wild flowers blooming off the scraggly tall shrubs mixed in among the camellia bushes…so beautiful. 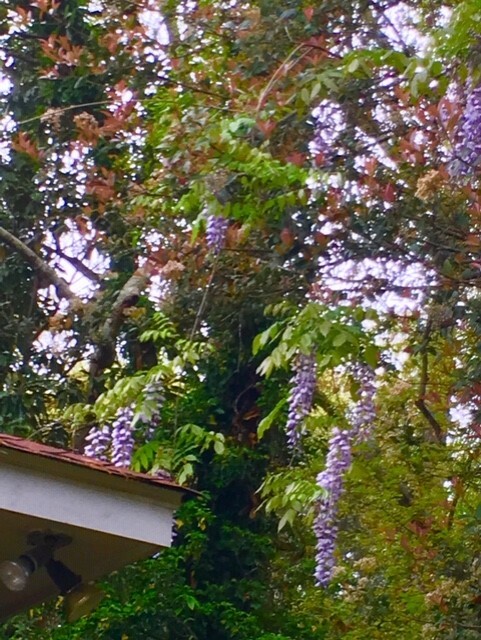 Strangely, from my new height advantage, I realized that wisteria was now hanging so low it was softly touching the roof corner of the house. So until tomorrow…All of us need to elevate our potential of hidden talents and passions. We can do this by climbing the mountains within each of us to reach our God-given peak. The best poem has not yet been written. The best song has not yet been sung. The best drum has not yet been smitten. The best bell has not yet been rung. 6 Responses to If You Can’t Look UP….Climb UP and Look Down! Isn’t the earth wonderful from the air…you can see fields, rivers and everything looks like it is neatly placed in rectangles, squares….concise geometric designs that never cease to amaze me…above the craziness of life is pure beauty. 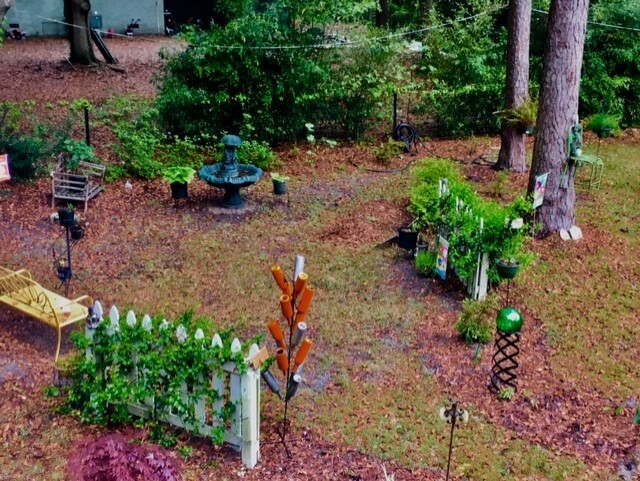 Love the view of your garden from the apartment…it is beautiful. Hope you are doing well. We have had JP for the last 3 days…getting used to a boy’s antics after 3 little girls. OH I would have loved to see him…there is definitely a difference isn’t there? Praying for you girl…the 16th…hoping for all good news to get you patched up and back to enjoying life at its fullest.